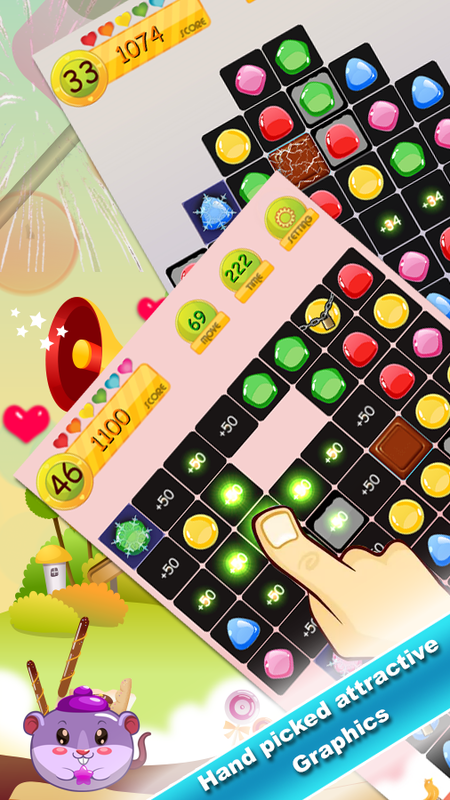 Candy Mania New Star is a brand new and amazing casual game, of candy with fast rhythm and incredible feeling. 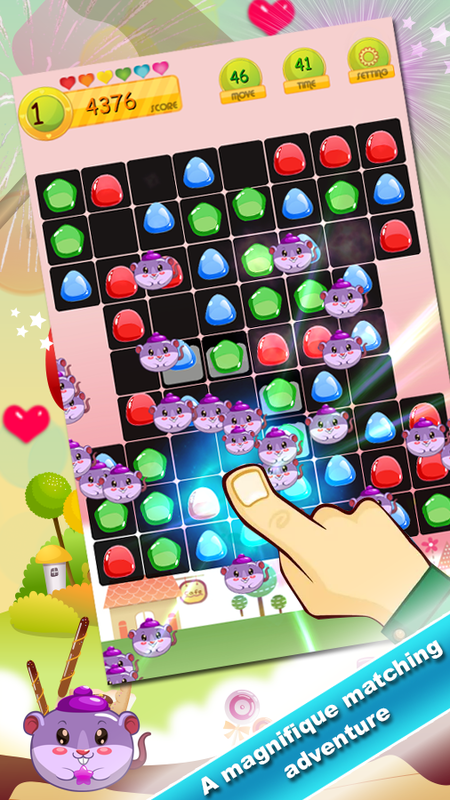 An classic and addictive candy Match-3 game, these colorful candy mania. 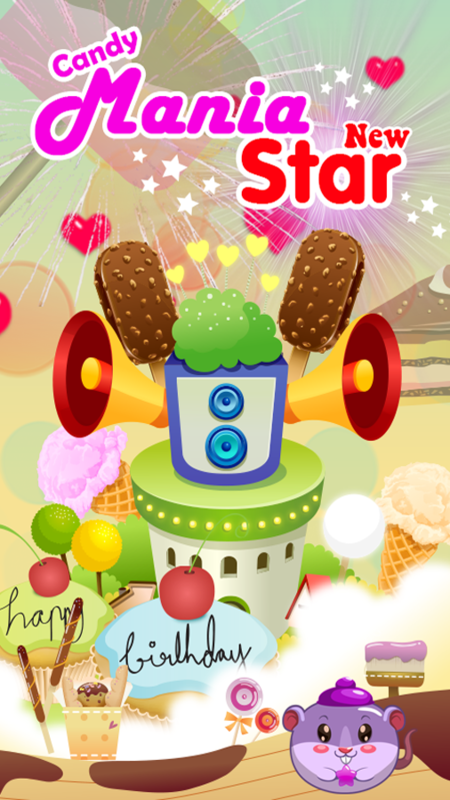 Candy, candy everywhere Touch feeling and feedback is amazing in Candy mania new star. There are many special candy when you get combo. With adventure mode, gravity will be random to change direction when candy drop. All you need to do is just tap on any sweet candy and crush it(them) down to prevent them being killed. Solve all the puzzles and try to get three stars in each level! ------------------------------------- Candy Mania New Star how to play: â˜› Swap and match many cute jelly bubbles to gain points. â˜› Match three or more identical jelly bubbles. â˜› Match four or more jelly bubbles will produce incredible results. â˜› Collect as many candies as possible before you run out of moves. 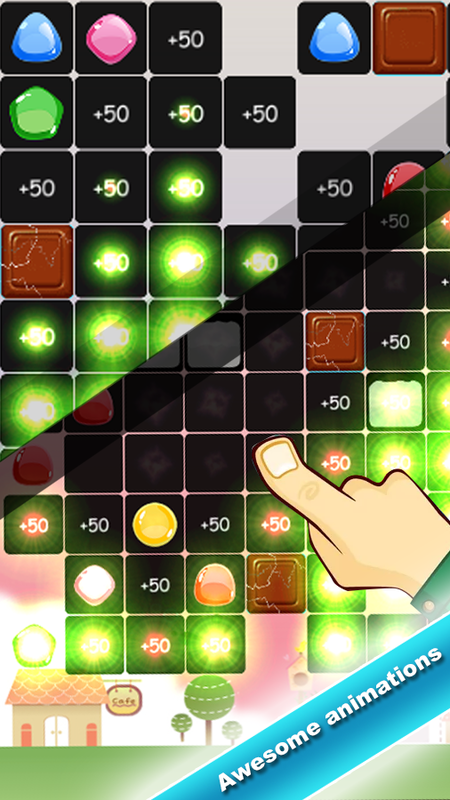 â˜› You also need to find those 3-Matches with the most AWESOME chain reactions. â˜› Quick Clear jelly bubbles to get more bonus scores. â˜› Win levels and unlock more boosters to help you gain high scores. Tips: Eliminate the candy more can get scores. two mode:clear mode and blast mode. 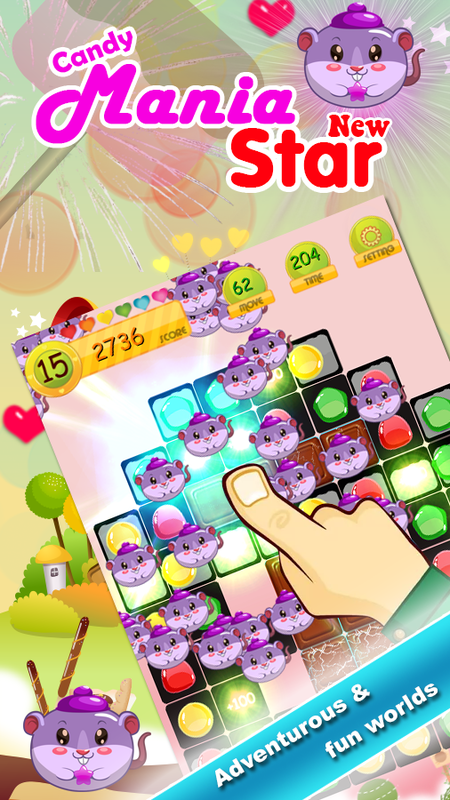 ------------------------------------- Candy Mania New Star Features: â˜› Smooth gameplay. â˜› Variety of sweet candy elements. â˜› Exquisite cool game screen special effects and props. , â˜› Multiple levels, challenges stimulate. â˜› Gameplay is very simple, easy to use. â˜› Addictive... great candy graphics ... fast movements. â˜› Various power-ups. â˜› Awesome visual effects with ultimate explosive. â˜› Many interesting and various levels ( 50 levels and update soon ). â˜› Special boosters & bubbles to help you pass those tricky levels. â˜› Power-ups for your enjoyment! â˜› Very beautiful candy. â˜› FREE Game which bring you more fun. â˜› Soothing music and sound effects. â˜› Nice and smooth animation. 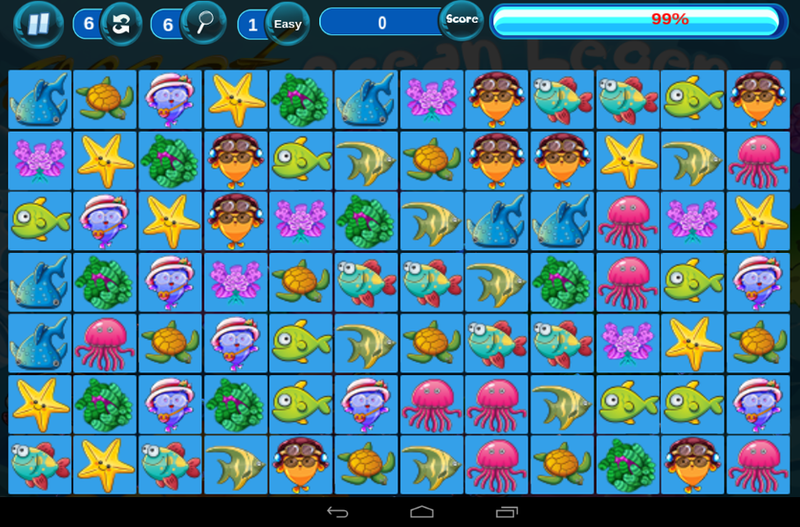 ------------------------------------- If you like match-3 casual puzzle games, you will love to play this game. Test your puzzle skills and have lots of fun! 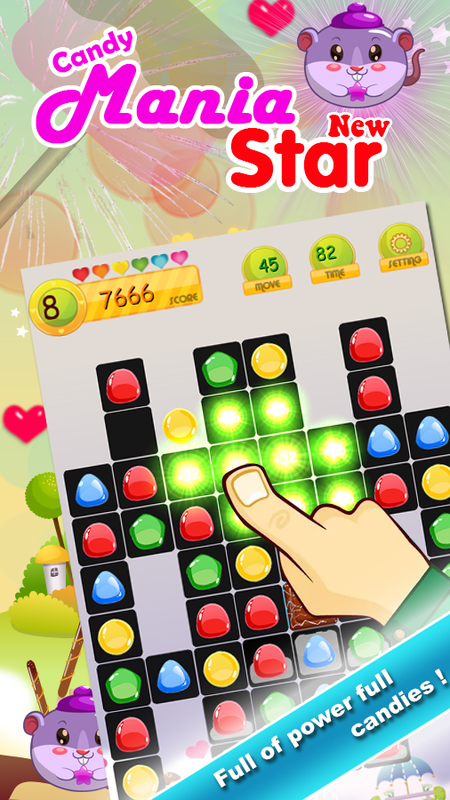 Candy Mania new star is easy and fun, You can be a legend. Grab Candy Mania NEW Star and puzzle right now!